Shirts With Random Triangles: Jerry Jones excited about Arkansas playing at Cowboys' home field AT&T Stadium on Sept. 27. 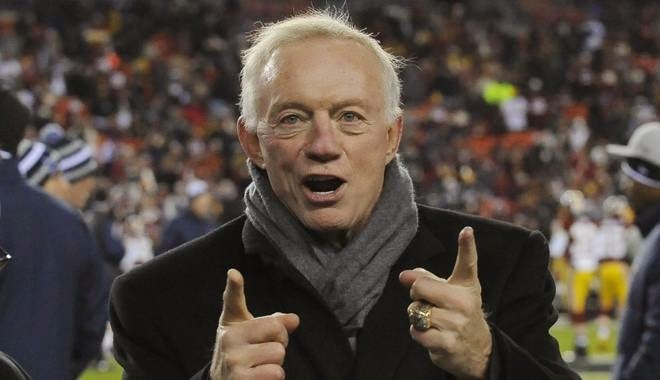 Jerry Jones excited about Arkansas playing at Cowboys' home field AT&T Stadium on Sept. 27. Jerry Jones. Via Black Sports Online. Jerry Jones is so excited, and he just can't hide it. The owner of the Dallas Cowboys recently told The Arkansas Democrat Gazette how much it meant to him that his alma mater, Arkansas, would be once again be facing Texas A&M in AT&T Stadium (a.k.a. The former Cowboys Stadium a.k.a. "Jerryworld") on Sept. 27. It's probably a good thing that Jones said "with the Cowboys," as his enthusiastic statement made it almost sound like he was prouder of hosting the Razorbacks than anything the Cowboys have done. Maybe that's reading too much into it.